From the For Him Collection of rugged bracelets which can be worn every single day. 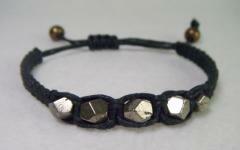 Black cords, irregular faceted Pyrite beads and Antique Bronze details are a classic look with an edge. The sliding knot fastening makes this bracelet adjustable.